Yeah! 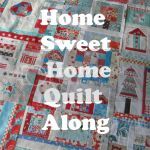 It’s time for Block 2 of the Home Sweet Home Quilt Along. Before we get to it though, I want to share with you a little about the designer, Diane Lapacek. Quilting and fabric dyeing are my passions. wanted to dye fabric, so I checked out some books and found another passion. I created this shredded flower technique for a class I was teaching at and I really like it. I think it is one of my best machine quilting efforts. And I really love the mixed fiber edging. I love all the creative parts. 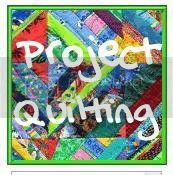 Planning, dyeing, cutting, sewing, assembling, and adding an amazing pieced border. Those finishing things like backing that really don’t add anything special to the quilt, but need to be done to finish the project. Favorite Adhesive: Quilt basting spray. Many of my readers already probably know that Diane and I are co-owners (along with our husband’s) of an apple orchard in Wisconsin (hence Kim’s Crafty Apple). The block Diane designed is only fitting for what we do. Enjoy! This is a very scrappy block. Pull out your smallest scraps. Nothing wider than 2 inches is needed here. I used a wide variety of greens for the trees, assorted lights for the background, small pieces of 8 different florals for the flower garden and dark and light blues for the checkerboard. We’re going to start by making a template for the apple treetops. Cut a 6½“ square of paper. I used an old newspaper. Something lightweight that will tear easily is best. Make a mark 1” in from the edge on 3 sides. Now, draw a “circle” that touches the bottom edge and is no wider than the lines on the other 3 sides of the square. This is the template for your treetop. You will make 2 trees, so you may want to make both templates now and build the trees together. They do not need to be exactly the same shape. Notice that one of mine is taller and the other is rounder. Keep your template by your ironing space. We are not going to sew on it until later. For now it will serve as a guide to the size and shape of your treetop. The treetops will be very free form, so there will be no cutting instructions. Pull out your smallest scraps for the treetops. I used a wide variety of greens. Start with a small piece that is about 1½ to 2” on each side. It doesn’t need to be square. I just used my scissors to cut a piece off the end of a leftover strip. Line up another scrap along one edge and sew them together. Press seam to one side. Add a piece to the opposite side. Press seam toward the last fabric added. Straighten the sides by laying your ruler across the end and trimming the jagged edges with your rotary cutter. Add pieces to the 2 edges that you just trimmed, pressing seams toward each fabric as you add it. The piece will now look pretty square. Trim off the corners to make it more rounded. Add strips, press and trim until your treetop is about the size of the template. Place the treetop on your template. One edge needs to follow the paper edge at the bottom of the template. Cut off any corners that go too far beyond template. Make straight cuts, not a perfect fit to the circle. Do not cut the paper! This one needs a little more trimming. Pin the treetop to the template, making sure one edge is even with the bottom of the paper. Add strips of background fabric to the edges of the treetop. I used various lights. Stitch through the paper. Do not sew beyond the edges of the treetop fabric. Press after each fabric is added. To trim, fold the paper back, place your ruler and cut off the jagged edges. Continue to add fabric strips in this manner until your fabrics go beyond the paper on all sides. Remove the paper. Spray starch. 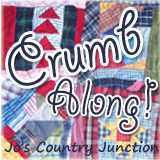 Square up to 6 ½” x 6½”. Cut a piece of paper 2 ½” x 6 ½”. Pick a piece of fabric for the tree trunk and lay it on the paper, near the center. About 1 to 1 ½” wide is good. It does not need to be straight. You’ll see mine below is not. Sew a piece of background fabric to one edge of the tree trunk, sewing through the paper. Press. Add additional background pieces to both sides until the paper is covered. Remove the paper. Spray starch. 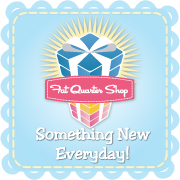 Square to 2½ x 6½ “. Sew the trunk to the treetop. My tree trunk was a little off center. I rotated the trunk piece and liked the fit much better. Now we’ll add the flower garden in the lower right corner. Cut 8 squares 2” x 2” from various floral fabrics. Sew them together to make 2 strips of 4. Press the seams all to the left on one strip and all to the right on the other. Sew the 2 strips together to complete the flower garden. For the checkerboard in the upper left corner. I created a very scrappy look using lots of different dark and light blue fabrics. Cut 12 1½” squares from dark fabrics. Cut 12 1½” squares from light fabrics. Pair each dark with a light and sew together. Press toward the dark fabric. Alternate the darks and lights to create a checkerboard and sew together. Sew the flower garden to the bottom of one tree. 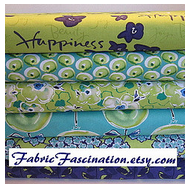 Cut a 1 ½” x 6 ½” strip of background fabric and sew it to the top of the same tree. Sew the checkerboard to the top of the other tree. Sew the 2 tree sections together to complete the block. Sew red buttons on for apples. 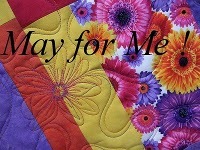 I’m going to wait until after my quilt is quilted to do this. Thanks for sewing along. Hope you enjoyed it. Click HERE for a printable PDF of this pattern! 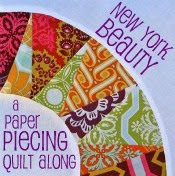 How beautiful, and it looks like so much fun, can't wait to dive into my stash of scraps and do this! What a fun way to make an apple tree. I love the new block!